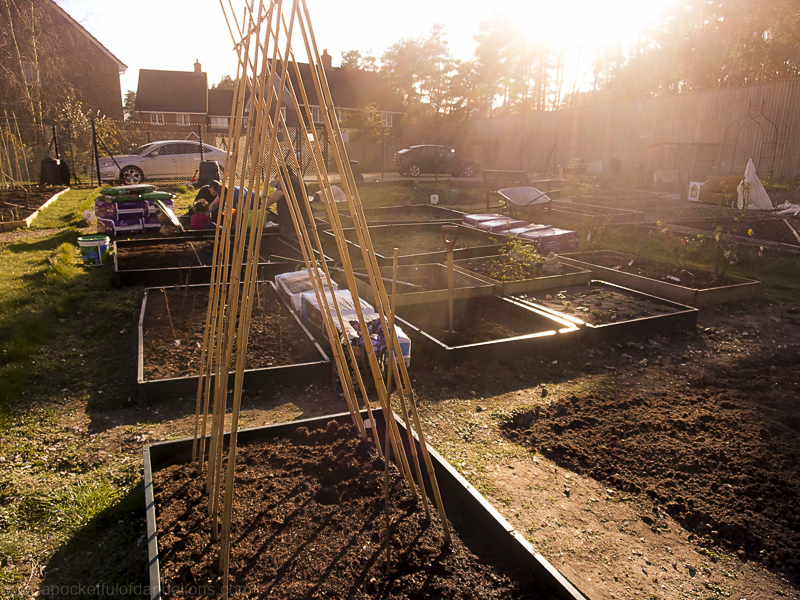 Not a lot of progress was made on our allotment in January and February but we’re more than making up for it now. We knew when we took the plot on that we had a lot of work ahead of us as the site that the allotments are on has been reclaimed from an area of undeveloped heath land. The whole site is filled with stones and massive lumps of concrete (imagine building foundations size!) so many of the other plot holders have unsurprisingly resorted to using raised beds. We decided fairly early on that we’d have to do the same if we wanted to harvest anything this year. The previous plot holder had left behind a raised bed so we used it as a starting point along with two we relocated from our back garden. My mum-in-law and I spent great deal of time putting our heads together over a big sheet of graph paper working out where we wanted the beds to go and what size we wanted them to be. Above all we wanted Bubs to have a little bed of her own to play with as we think it’s important for children to know where their food comes from and to have the responsibility of taking care of plants and flowers. My mum-in-law found these brilliant raised beds on Amazon. They’re made of plastic and can be configured into whatever size and shape you need by slotting lengths together with hinges and corner brackets. Altogether we have eleven raised beds – four measuring 1x1m (including the two from our garden), three measuring 2x1m (including the one that was already on the plot) and four measuring 2x2m. At the top of the plot is our potato bed which isn’t edged yet. We’ve filled the beds with bags and bags (and bags!) of multipurpose compost from B&Q. They usually have a ‘3 for’ deal on which is great as it takes around four bags to fill one of the 2×2 beds. Developing an allotment is fairly expensive in the beginning but we’re looking at it as an investment and something we’ll only need to do once. The one with the spade in it is Bubs’ little plot. We have planted fruit bushes in the middle stretch of beds. Blackcurrants, redcurrants, gooseberries, strawberries, raspberries and rhubarb are all settling in nicely to their new homes. Oh I almost forgot, we relocated a poorly looking goji berry from the garden to the allotment too and it’s now flourishing. Obviously the bright, open position suits it a lot better than our shady garden did. Back at home our back garden has been transformed. Gone is our little veggie plot and in its place is a new greenhouse. I’d always thought that a greenhouse was a bit unnecessary but I have to say I love ours. It’s made a big difference to how quickly our seeds are germinating and how established our veggies are before we plant them out. Plus it’s somewhere to go for a few minutes peace and quiet whenever Bubs is having a conniption in the garden because there’s sand in her sandpit. Working on the allotment is a wonderful way to spend a sunny Sunday afternoon. It’s become a bit of a family affair with both Hubs and his brother pitching in to do weeding and digging and Bubs is in her element when we’re there. She directs the work with the all the aplomb of a site foreman and is quick to dish out praise if we’re keeping up to her standards. “Dig here daddy! Good boy daddy!” and “Well done ladies, nice work!”. She’s so darned cute wearing her Peppa wellies and my sun hat while pushing her little wheelbarrow from plot to plot and picking up stones. The unexpectedly warm weather has meant that April has already seen the planting of the first veggies. We have first and second early potatoes in the top bed. Peas and broad beans beginning to poke through in the bean bed as well as carrots and parsnips in one of the 2×2 beds. Both my mum-in-law and I are short and yet somehow we underestimated our arm length when we set about creating the 2×2 beds. Neither of us can reach the middle! We’re going to need a couple of scaffolding planks to put across them but in the meantime I’m using the ‘chuck them in the right direction and hope for the best’ method of seed sowing. In the greenhouse we have 12 tomato plants (6 maincrop and 6 cherry) as well as 3 cucumbers which aren’t faring very well. I’ve never grown cucumbers before and I’m wondering if they need more attention than we’ve been giving them. If anyone reading this has had any luck growing cucumbers then please do give me some advice! As well as the tomatoes and poorly cukes we’ve got two shelves full of seedlings waiting to go up to the allotment. We’re trying out a few unusual varieties of veg, such as red brussels sprouts and round courgettes, and we’re going to grow an Atlantic Giant pumpkin for carving at Halloween. On average they reach over 800lbs in weight; I think I might be biting off more than I can chew in the pumpkin carving stakes! Yay, I loved reading your allotment update. I wish I could come a spend a few hours on it with you as it looks like such a lovely place to while away the hours. 🙂 Bubs sounds like she’s keep everything in order though. I am growing cucumbers at the moment (currently still in the house) and they are taking over the place! What seems to be the issue with yours? Not that I have any idea what I’m doing of course! 😉 I’m making it up as I go along. They’ve wilted and died despite regular watering. I read an article in one of my Kitchen Garden magazines yesterday that makes me think that we planted them out too soon. I am really looking forward to picking fresh fruit and veggies for Bubs’ dinner. Hopefully she won’t do what I did to my grandad’s garden and pick (and eat) all of his peas in one go!